A dog is like another member of the family. Everyone likes to have their favourite companion by their side at all times. Taking a dog on holiday is not always easy. The thought of having to leave them in a kennel can leave you feeling guilty. So why not choose a holiday where you can take your dog with you? As long as you ask us beforehand, you can travel the UK with our dog friendly campervan hire. 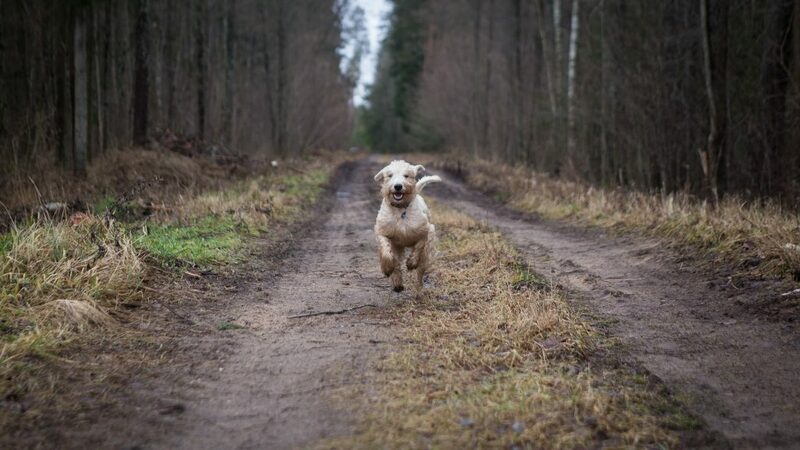 Dogs enjoy the outdoors as much as campers and campervaners! This makes campervan hire perfect for dogs. They can enjoy long walks whilst you go exploring all across the UK. There are spectacular areas in the UK – ideal for keeping a dog entertained. 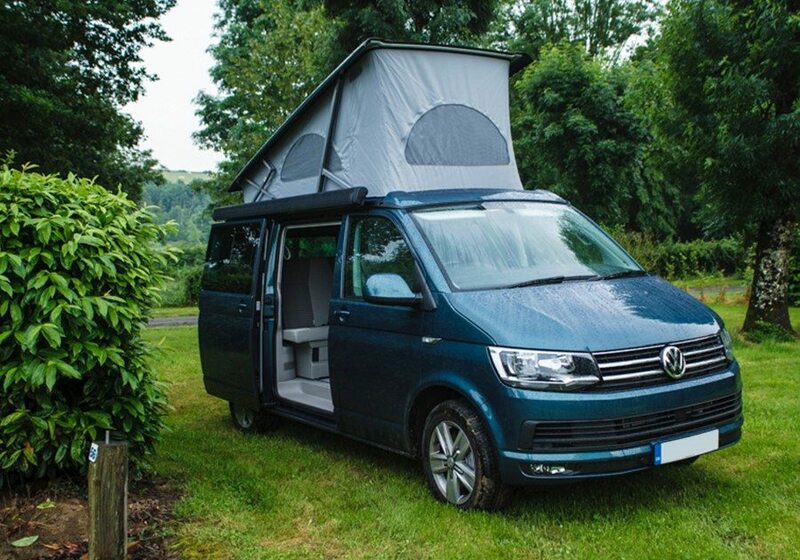 You can go anywhere in the UK in one of our VW Campervans. You can be somewhere new everyday, exploring with your dog. Just think of the fun you could have. Strolling down a beach; climbing a mountain; jumping in a lake or the sea; or just ‘chilling out’ around a campfire. Both you and your dog can enjoy these great activities. Our vans are high spec and can sleep a family of 2 adults and 2 children, or 3 adults. 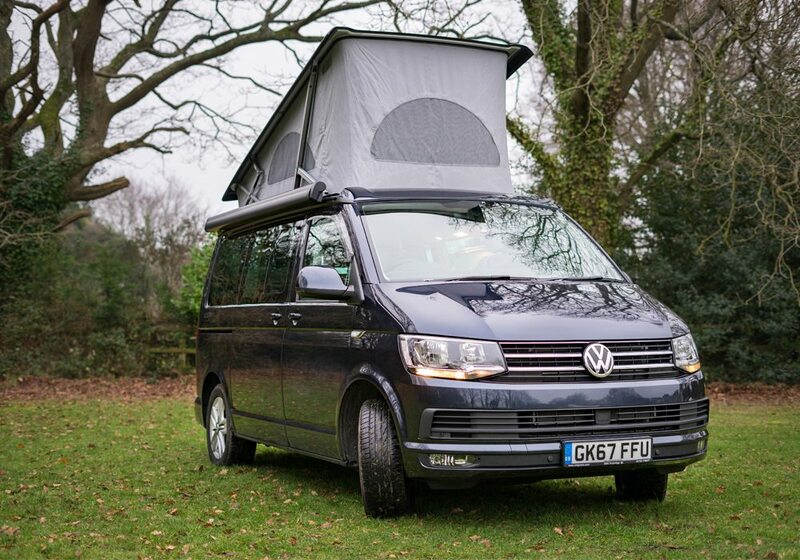 You can browse all of our VW Campervans and see where your dog can fit. You might want to consider bringing a dog bed to put on one of the seats. With dog friendly campervan hire, it’s recommended to plan ahead so you all have the best time possible. Make sure that you have a lead, a water bowl, a dog seat belt, dog food and some toys to keep them occupied. Another thing to consider is where the veterinary practices are on your route. You may decide that you want to stay at a campsite. Click here to find out where the camping sites are which allow dogs. You’ll see that there are a whopping 137 sites just within 50 miles of us (Ringwood, Hampshire). Search for an area where you want to go and check which ones allow dogs. On some of these sites we can offer a 30% discount through The Camping and Caravanning Club. Alternatively, you can park up at a spot you like and sleep under the stars, so you don’t have to worry about planning where you stay. Interested in Dog Friendly Campervan Hire? We have lots of campervans available if dog friendly campervan hire sounds good to you. Our VW Campervans include, DEBS, JURASSIC, FOREST & MALIBU. They are all high spec and spacious campervans, ideal for fitting a dog in. There is plenty of great features included, as well as some brilliant optional extras, including a bike rack and portable BBQ. You can contact us with any questions and we will be happy to help organise and plan your hire. 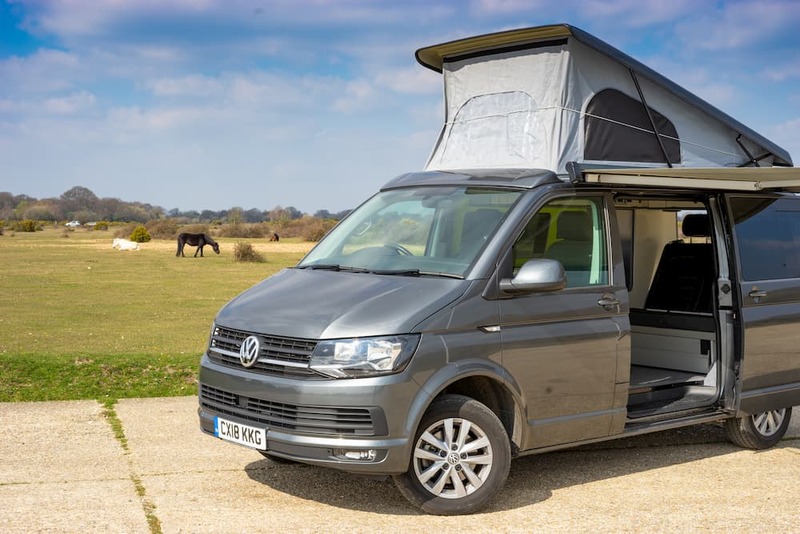 Before you hire one of our VW Campervans, please inform us that you are bringing a pet and tell us its size, breed and how many pets you are brining. Should we find that animals have been in the vehicle without consent, there will be a £100.00 charge.